The success story of Berkshire for a long time has focused only on Warren Buffett, the front man with the knack of explaining even the most complicated issues in a funny and folksy manner. Charlie Munger was for a long time only considered to be the “funny side-kick” who seems to be asleep most of the time during Berkshire’s annual share holder meeting. This changed somehow in the last few years, among them the excellent “Poor Charlie’s Almanack” from Peter Kaufmann and there seem to be a couple of Charlie Munger books already released or in the pipeline. So I was pretty surprised that there is a much older book about Charlie than the others. “Damn Right” was written and released in 2000 and is based on many interviews, some with Charlie Munger directly but also with his family and former colleagues and friends. 2000 was a year where many people thought that Berkshire had lost it, maybe one reason why the book didn’t become more well-known. The book starts slowly with some stories on his parents and grand parents but gets more interesting pretty quickly. Munger started early on as a lawyer but discovered that he can make more money by being a real estate developer and started buying plots, building and selling apartments and houses. He then started to buy parts of or whole small companies. For a very long time he did so as a pure “Graham investor”, picking up bargains or even net nets. Munger then started Munger Wheeler in the 60ies but was already discussing investment ideas with Buffett over the phone. He also invested together with Buffett and another Californian investor and friend Rick Guierin (One of Buffett’s “Superinvestors”) into the same companies sometimes even closely held ones. The most famous common acquisition of this time was the Blue Stamp company. Wheeler & Munger performed greatly from 1962 to 1969 but did badly the next few years when Warren Buffett hat already closed his partnership. Munger dissolved the partnership in 1976 but still had a track record of making ~24% p.a.against 6% p.a. fr the Dow Jones. The changing point in his history is clearly the purchase of See’s where they paid, for the first time in their history, above book value for a company. Munger is quoted that they would not have bought Coke if they hadn’t started with See’s. 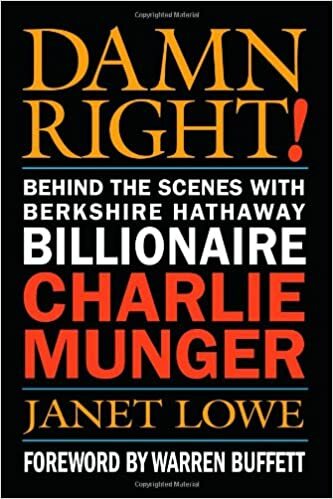 Interestingly enough, the book says that already in the late 90ies, Munger wasn’t involved that actively in Berkshire anymore. For me the question always remains: Would Buffett had been as succesful without meeting Munger or would he would have become “just another succesful” investor ? Who knows. Overall the book is definitely a good read for any value investor and tells most of the Berkshire story from a slightly different perspective. HIGHLY RECOMMENDED. Thanks for the book review! I also have a recommendation. Last week I read ‘The Shipping Man’ by Matthew McCleery. Written by someone who nows the shipping industry inside and out. Both highly informative (if sooner or later you intend to invest in this industry) and fun to read. I have read a lot about Munger. My main (new) takeaway from reading the book was how bad his decisions were on a personal level when he was young and how brave he was when faced with great adversities. On the personal front marrying while still in Law School and starting a family is just incomprehensible to me. However those were different times. Then he was hit with a divorce, lost everything in the process and had to watch his young child dying of cancer. So there he was 30 years old divorced, broke and heartbroken. The great lesson is that Munger did not allow himself to loath in self-pity. He just took the hit, bounced back and turned himself to one of the richest and most successful investors of all time. How about that? (p. 109): Charlie made very incoherent presentations of himself to people who did not know him. Came accress as flimsy. (Ch. 10): Blue Chip Stamps is a must read. How you can be sucessfull owning a business with a float despite Revenues falling of a cliff. (p. 121) Don’t do busienss with people you don’t trust. Economics are irrelevant if there is not trust. Thanks for the great comment !